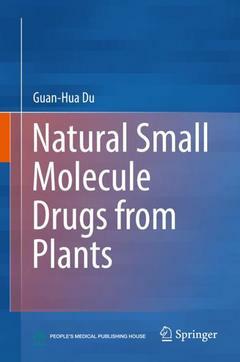 This book discusses 120 types of natural, small-molecule drugs derived from plants. They are grouped into 7 parts according their clinical uses, such as drugs for cardiovascular diseases, for metabolic diseases, for neuropsychiatric diseases, for immune-mediated inflammatory diseases, anti-tumor drugs, and drugs for parasites and bacterial infection. Each chapter systematically summarizes one drug, including its physicochemical properties, sources, pharmacological effects and clinical applications. To help readers understand the drug better, the research and pharmacological activity for each drug is also described, which serves as a salutary lesson for future drug development. Written by frontline researchers, teachers and clinicians working in field of pharmacy and pharmacology it provides an overview of natural, small-molecule drugs derived from plants for researchers in the field. Natural small molecule drugs for the prevention and treatment of cardiovascular diseases.- Natural small molecule drugs for the prevention and treatment of neuropsychiatric diseases.- Natural small molecule drugs for the prevention and treatment of immune and inflammatory diseases.- Anti-tumor Drugs.- Natural small molecule drugs for the prevention and treatment of parasitic and bacterial infections.- Vitamins.- Natural Product Compounds in Pharmacopeia. Dr. Guanhua Du is a professor at the Institute of Materia Medica, Chinese Academy of Medical Science & Peking Union Medical College, the director of the National Center for Pharmaceutical Screening, and was the president of Chinese Pharmacological Society (2007～2017). He serves as the associate editor for the journals “Acta Pharmacologica Sinica” and “Pharmacology and Therapeutics”. He is also an editorial board member for several Chinese and international journals. Prof. Du’s research mainly focuses on screening and developing new drugs, particularly for neural and cardiovascular diseases. He has published more than 500 articles in international journals in the area of pharmacology.